Not every Kickstarter is successful the first time around. Some people would say, "well, you didn't make it the first time. I guess you're finished." I say, "Nay nay!" (RIP John Pinette) Many Kickstarter campaigns start out with their first project not making it. But after some refining, retooling, and reconfiguring, they relaunch and can come out further ahead than they ever had dreamed with the first campaign. Will that happen with Ether Wars? Only with your help. They're back up on Kickstarter now. 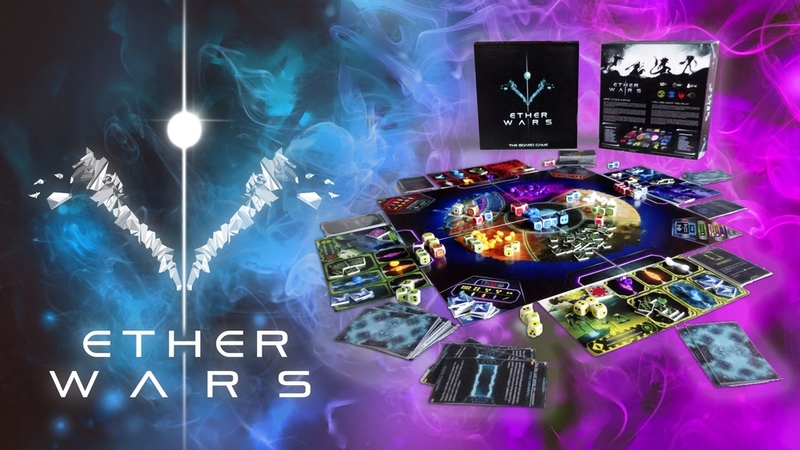 Ether Wars is a worker-placement game. However, your workers aren't just meeples or square blocks. Well, ok, they are square blocks, but those blocks are dice. Different sides represent different levels of troops that you'll use to take over and control areas of the Ether. You'll have to gather resources and outmaneuver your opponent if you want to win. There's no one strategy to win the game. Go for the throat or simply control the board to your advantage and starve out your opponent's pieces. The Kickstarter campaign is up and running now. They're right around 1/3 of the way to their goal with still 29 days left to go.